If you are considering an architectural project, but are unsure of how to start, Hayes & Partners offer a free-of-charge no-obligation initial consultation. So if you would like to speak to us, please don’t hesitate to get in touch – details can be found on our Contacts page. At our meeting we will discuss your requirements, what you would like to achieve, if you have any inspirations – this is your design brief and will form the basis of our scope of work for the project. Once we have reviewed our scope, we will write to you to outline our fee for design services (in most cases) up to and including the submission of the Planning Application and/or Listed Building Consent. We also recommend that prospective private-residential clients take a look at this handy leaflet from the Royal Institute of British Architects (RIBA). 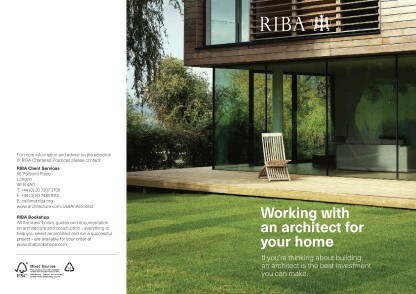 The leaflet sets out what you should expect when working with an architect for your home. Hayes & Partners believe good architecture is the enclosure of space, capture of sunlight and framing of views. It is a balance of proportion, quality of materials and efficient use of area. Good architecture should surpass the clients’ needs, expectations and aspirations. Whatever the style - traditional or modern - we believe that our designs should be the best examples of their type. Whether we are referencing an historical building, or creating something new with award-winning contemporary influences, we understand that it is only excellent buildings that survive the test of time.